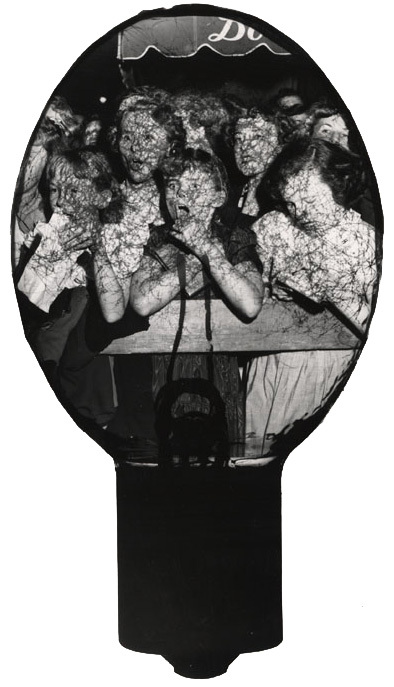 Weegee was one of the early-mid-twentieth century’s preeminent photographers of children. He captured the (perhaps fleeting) joy, fun, freedom, and weirdness of childhood. These photos were made with the relatively new infrared film. Perhaps Weegee’s photos of children watching movies were made in two theaters. There are two types of seating. (Which theater had beautiful wooden upholstered seats? As seen in the next week’s post.) Some of the infrared children watching movie photos were made in the Loew’s Commodore Theater, 105 2nd Avenue. It opened in 1926. The building was a movie theater, a Yiddish theater, the Fillmore East, a disco, and now a bank. The light colored garment on the right side of the first photo is worn by the (adult) matron of the “Children’s Section.” Although “The Guest Wife” starred Claudette Colbert (1903–1996) and not Loretta Young (1913-2000), and it’s probably not the movie the kids were enjoying, referencing that movie might indicate that the photos were made in 1945. Laughing, lively children are Weegee’s People. Saturday afternoon show for the youngsters at LOEW’S COMMODORE THEATRE on SECOND AVE… the picture was “GUEST WIFE” LORETTA YOUNG was chased all over the screen by DON AMACHE (the inventor of the telephone) and another guy… Some of he kids brought their lunches… LOLLY POPS… and one fellow even brought a (toy) pistol… I took the pictures in the dark with INFRA RED RAYS so (that I wouldn’t) not to disturb anyone. This entry was posted in Fans in a Flashbulb and tagged children, infrared, Manhattan, movie, movie theater, New York, New York City, Weegee, Weegee Wednesday. Bookmark the permalink.